Treasury Secretary Jack Lew said if Congress fails to raise the debt ceiling, "it would be impossible for the United States of America to meet all of its obligations for the first time in our history." 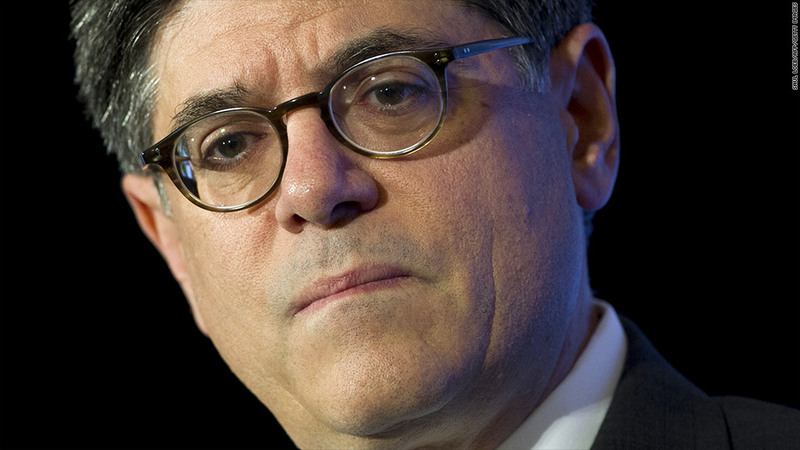 Treasury to Congress: The heat's on to raise the country's debt ceiling. Treasury Secretary Jack Lew said Wednesday he now estimates he will have less cash on hand to pay the country's bills in mid-October than he previously thought. Instead of the $50 billion he estimated a few weeks ago, he now thinks the cash balance will be closer to $30 billion. "This amount would be far short of net expenditures on certain days, which can be as high as $60 billion," Lew said in a letter to lawmakers. "If we have insufficient cash on hand, it would be impossible for the United States of America to meet all of its obligations for the first time in our history." He also said he now estimates the so-called extraordinary measures that the Treasury Department has been taking since the spring will be exhausted no later than Oct. 17. Lew also noted, as he has in the past, that his estimates are based on a number of factors that are not entirely predictable -- such as the amount of revenue flowing into federal coffers on any given day. Treasury handles about 80 million payments a month. Those payments are not evenly spaced out. So on some days more is owed than on others. And by mid-October, if Congress hasn't raised the borrowing limit, Treasury will only be able to pay the bills that come in with the cash it has on hand plus whatever revenue comes in. Payments include IRS refunds, Social Security and veterans benefits, Medicare reimbursements for doctors and hospitals, bond interest owed investors, payments to contractors and paychecks for federal workers and military personnel. Based on Lew's latest estimate, the Congressional Budget Office now projects Treasury may exhaust its cash balance and therefore no longer be able to pay all the country's bills in full and on time sometime between Oct. 22 and Oct. 31. The CBO, however, also said the "x" date -- as it's known -- could "fall outside that range." Those projections are sooner than CBO had been anticipating a few weeks ago. Among other reasons, corporate tax receipts have fallen short of expectations since then. Lawmakers have been at loggerheads over raising the debt ceiling because President Obama and Democrats want a "clean" increase. They note that raising the ceiling doesn't give Congress a license to spend more but rather allows the country to pay the bills it has already incurred. Those obligations are the result of commitments lawmakers from both parties have approved over the years. Republicans, meanwhile, are insisting that any increase in the debt ceiling be tied to spending cuts and, among some conservatives, the defunding and delay of Obamacare. House Republicans have proposed that absent a debt ceiling increase, Treasury could be allowed to prioritize which bills it pays with the funds it has on hand and that the top two priorities should be paying interest on the debt to bondholders and making payments to Social Security recipients. Treasury has said that's unworkable. "Any plan to prioritize some payments over others is simply default by another name," Lew wrote. "It would represent an irresponsible retreat from a core American value: We are a nation that honors all of its commitments." If Congress fails to act in time, Treasury will have to make difficult -- and legally questionable -- decisions about who should get paid and who should be stiffed. It may decide to pay some bills in full and on time and delay others. Or it may decide to delay all payments until it has sufficient revenue on hand to pay them in full.